Why would I need self storage in Waxhaw, NC? There are a variety of reasons why you might need self-storage in Waxhaw, NC. How much is a storage unit in Waxhaw, NC? The cheapest storage unit in Waxhaw, NC is $30.00 per month. What size storage units do you have available in Waxhaw, NC? In Waxhaw, NC we have sizes that range from 5'x5' to 20'x30' to suit your storage needs. How much is it for a 5'x5' storage unit in Waxhaw, NC? The cheapest 5'x5' storage unit in Waxhaw, NC is $30.00 per month. With a convenient location in Union County, Waxhaw offers a tight-knit community and the easily accessible amenities of Greater Charlotte. Thanks to a diverse economy and an array of entertainment options, Waxhaw's population has grown dramatically in recent decades, jumping from about 1,300 in 1990 to more than 14,000 in 2015. New housing, recreational facilities and retail businesses all have been added throughout the town to keep up with its fast-paced growth. Waxhaw dates back to the 1700s, making it one of Union County's oldest towns. The town takes its name from the Waxhaw tribe, who were originally called the Wysacky. Waxhaw itself wouldn't be chartered until 1889, established by Scotch-Irish and German settlers. 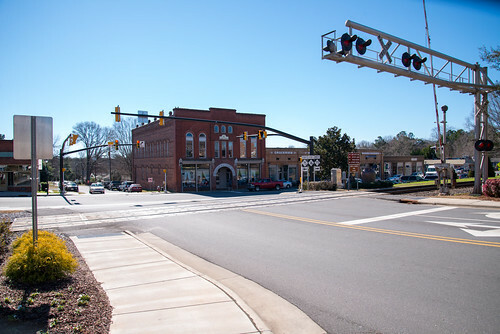 Thanks to the arrival of the railroad in the 1880s, Waxhaw blossomed into a thriving hub of activity. Over the years, like many communities in the American South, the town was shaped by textile manufacturers, cotton mills and the railroad. The small town of Waxhaw has seen exciting growth thanks to its close proximity to Charlotte, the area's financial and urban center. In fact, Charlotte is now headquarters for more banks than any other U.S. city other than New York City. For those working in Charlotte and willing to commute, Waxhaw makes a great place to put down roots. In recent years, Waxhaw has become a major destination for antique shopping. It's also home to a large number of local restaurants, ranging from high-end dining to casual, family-owned cafes. Many of the best-known businesses in Waxhaw are along its Main Street. If you're interested in exploring the city's most historic sites, the Waxhaw Historic District contains over 100 notable buildings and examples of architectural styles including Queen Anne and American Craftsman. Waxhaw schools fall under the jurisdiction of Union County Public Schools. Schools are typically assigned based on your home address. You'll also find a mix of private and charter schools, including Montessori and faith-based campuses, in Waxhaw. Utilities: Waxhaw's main utilities providers include Duke Energy, Union Power and the town utilities department. Garbage and Recycling: Waxhaw is divided into several trash collection zones, with each zone assigned a specific pick-up day. The town also facilitates weekly recyclables pick-up. Transportation: Local transit options include the Charlotte Area Transit System (CATS) and the LYNX rail. Waxhaw consists of four established neighborhoods, with many homes priced well above the national average. High demand and growth have made the Waxhaw housing market fairly expensive, though there are still plenty of reasonably-priced options. Renting is another option, whether you choose a compact apartment in a large complex or a landlord-owned single-family home. Our lowest priced units in Waxhaw, NC average $71.33 per month. 97 people have reserved units in Waxhaw, NC in the past 30 days. There are 3 locations within Waxhaw, NC's city limits. There are 3 locations in Waxhaw, NC that offer AC and Heating features.